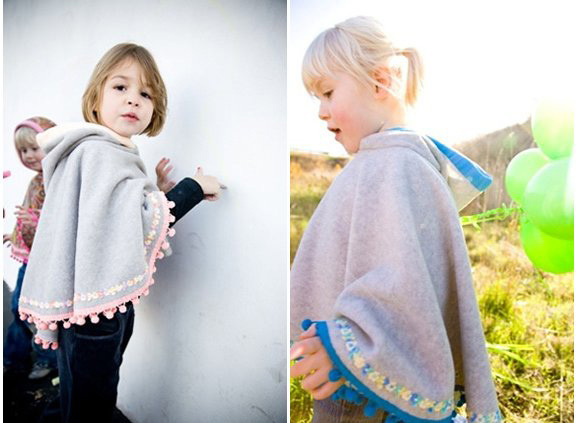 Peri Poncho – turning bottles into ponchos! A poncho is fun alternative to a jumper, just ask my daughter. Your child can keep warm and still play freely without being restricted by bulky sleeves. These ponchos sure are cute to boot and best of all, they can twirl! 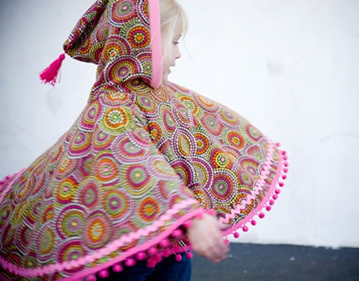 These gems from Peri Poncho are handmade in the North West USA and come in great fun prints and colours such as orange, green and pink. With gorgeous details such as pom-pom trims and tassels, plus a roomy hood to keep ears warm, they’re sure to delight any little Miss! There are three fleece types to choose from – Eco Fleece is made from recycled plastic bottles but still very warm and cosy, Winter Fleece is perfect for average winter days and Micro Fleece is great for spring or milder weather. If you want something a little different, then a poncho is the perfect winter wardrobe choice that’s easy to wear. There’s no sleeves to contend with, just simply slip it over the head! You get great mileage from a Peri Poncho too – the roomy fit will see your child through a couple of winters. Peri Ponchos are available now in Australia from Bearing Gifts for $65. Delivery is available all over Australia.